Eaton Rapids Joe: "They all look the same to me." I shudder to think what "bone in" pork rectums would look like. ...said the proctologist. He was immediately fired. Come on, folks. Lighten up. Joe, as a community service you owe it to us to let us know what these are used for. I'm sticking with the kosher hot dogs until I hear from you. 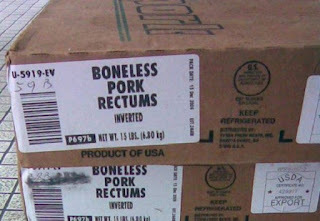 I believe they are exported to other countries where they are often used for sausage casings. The kind of sausage is not specified. The "Kind Not Sold Here" is a great answer, thanks, and still sticking with Hebrew National. That is not entirely true. Approximately 35,000 are shipped every year to law schools in the US.